What Keeps Show Staff Busy on Setup Day? Setup days are very long days for Show Staff, usually lasting up to 12 hours or longer, or until everything is done and the Show can open. After each area is completely set-up, staff members all pitch in to help each other finish up. A very good humored, friendly, cooperative, and supportive staff makes it all easy. Nancy and Carol enjoy setting up the Shopping Mart for you! On set-up day staff person, Nancy Morrissey is on the loading dock early to check-in our valued exhibitors. After that, she's off to set up the Make It/Take It and FREE Lecture areas. Next, she sets up the Show office area, free literature table, best booth ballots, the ever-famous door prize table, ticket-taker table, Hubby Corner and the Show program table. Sounds like a lot of work, but it has to be easier than her previous occupation. (Imagine 25 kids in one room for 6 hours.) Yes, you guessed it - Nancy was a teacher! As her areas are complete, she helps with the set-up of other areas in the exhibit hall. As the Show opens, Nancy directs security, helps volunteers, oversees our Guild ticket takers and answers attendee questions. She is also known as the "voice" of CATS because she makes announcements and gives away wonderful door prizes, all with the help of a microphone of course. The ticket area involves unloading several trunks full of supplies. The ticket desk opens about an hour before the Shopping Mart opens. Members do not have to purchase tickets, and are allowed to enter the Mart one (1) hour before the general public. The ticket booth is open to sell tickets, so that attendees will be prepared when they are allowed to enter and will not have flashbacks of long lines at Disney World. This is definitely an area where we have to work quickly, as there is a long line of anxious people that cannot wait to get in and shop, shop, shop! It is also nice to see attendees bring their spouse or significant other along. Whether it is to help pick out merchandise or just carry the bags, they are always welcome. For the most part, this is the first place a Student or Member will come to, upon arriving at the Show. They arrive excited, enthusiastic and in a rush to be off to their classes. Here they pick up their name badges. Members also receive Member pins, "Keepsake Kash" to spend in the souvenir booth and all the other benefits that come with Membership. This is also an area where you can sign up for a new Membership. Cleo having fun with the Concession personnel. I wonder what she ordered? Stitching is hard work and requires sustenance to keep those fingers and brains going. Generally, sustenance is very high on a stitcher's list, usually right after stitching! The food available at the shows varies from stadium-type fare like hot dogs, nachos and sodas to soup, salads and lattes depending on the facility, city and distance from the Shopping Mart. At the Mart itself, the stitcher will find lunch type or munchie food like chips, cookies, hot dogs, and drinks. The hotel is usually attached or very convenient to the Mart. At the hotel a stitcher can find coffee shop dining as well as more formal restaurants. Hence the reason we all come home weighing 10 lbs more than when we left! The Show also offers three events that include dining. The Progressive Sampler is a sit-down dinner and stitching event on Thursday evening. On Friday night the Show Partners host a themed banquet that is both fun and filling. The high dining experience is second only to the entertaining interactive program presented after dessert. Saturday morning a buffet breakfast is served prior to a stitching session. Each menu is selected by Show Staff with you in mind. How is the Showcase Organized? The Showcase is an opportunity for the you to display your needlework. Some entries may be published designs, sometimes the published designs have a different twist or often the stitcher's original design. It ís exciting to see the pride and joy each stitcher has when their work is displayed! Each entry is judged by local guild judges but it is a "friendly" judging - emitting praise with positive comments and suggestions for improvement. Once the Showcase trunks are delivered to the Showcase area by the set up crew, Jo Lee begins the layout of the easels and major display tables. The biggest challenge in the Showcase is to guess how many pieces we might receive and getting the entries placed on easels. If the entries aren't suitable to place on easels, they are placed in a covered display or on display tables. Guild members triple check to make absolutely sure that each piece is properly identified and secured. If too many entries are received in the final hour, it puts a real push on the judges and makes the setup staff scramble at the last minute to adjust the easel spacing or tabletop displays. Why do we have to scramble? We want the Showcase opening to be on time. However, if too many entries come in late we are scurrying around to make sure that you are able to enter the display on time. We know how anxious you are to see your piece or friends piece proudly displayed! From the very beginning of the Festival week, Showcase Coordinator, Jo Lee Tarbell, meets with the local Guild members to update them on the how each entry is received and reviews the evaluation form used by Judges. Once stitchers arrive with their entries, they are logged by number in a master list book, on the display piece and on the evaluation form. Judges are not aware of the person's name. They only see the entry number. The entries that are accepted are then placed on easels or in display units. Some entries are not displayed. For example, many stitchers bring in their pieces just to have them critiqued by the Guild judges. They may not be properly framed or even finished. One entrant asked that her piece be removed during the Festival because once the spotlight was placed on the easel to highlight her piece, a major flaw became evident. She was so embarrassed she wanted it removed. Two special prizes are awarded: Judge's Choice and People's Choice. The judges pick their favorite entry and you, the People, vote for your favorite - each winning a special ribbon and a basket brimming with Anchor products! Showcase entries are just as different as the people who stitch them. They may be a first piece stitched to a winning floral masterpiece that used every DMC color. (That winner won every Anchor cotton floss color, so she can stitch it again!) We have had entries from men in almost every Festival city and ladies they are outstanding! Everyone enjoys the entries from children ñ they are all winners! Husbands often encourage their wives to enter their work, many even help deliver the stitchery. One dear husband was so anxious to please his wife he had her work framed while she was out of the country - only problem was one of the pieces wasn't finished being stitched! The framer noticed that a few stitches weren't finished but her husband told the framer, "Sheíll never notice". Ha! Entries even come from far away places. The entry that has come the farthest was from England - hand carried of course, on the plane and it was a winner! We also have the privilege to travel with the winning entries from the PieceWork Magazine Sampler contest. They are breathtaking and most inspiring! Another feature of the Showcase is the Kreinik Holiday Ornament Contest. when he found out she won the contest! So put some love in your stitches and bring your piece to the next Festival Showcase.You'll be a winner in our hearts! When you can't possibly fit one more thing into your shopping bag, it ís time to head to class or one of the special Festival events! You've been giving your attention to the first Cross Stitch Festival ring of entertainment, the Shopping Mart. But there's much more to our Show. In an upcoming, month we'll shine the spotlight on the Festival's classes and events. 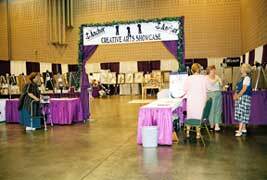 Don't miss experiencing the other two rings of the Greatest Show on Earth, the Cross Stitch Festival sponsored by the Creative Arts & Textiles Show! Lorri Birmingham and Terri Katis are about half-way through with teardown of the Lorri Birmingham booth. John Lane with J & S Craft Stands finishes packing the last box and then it's off to pack the truck! As the final hour of the Show approaches, tear down begins. Imagine moving your office 6 times a year ... that's what we do! Tear down doesn't take as long as set-up. Everything is placed back into its own trunk, box, etc. Well, almost everything gets back into the correct container. Then all freight is transported to the loading dock where our setup crew places everything on pallets and then it is loaded on the CATS tractor-trailer. While most items are ready to travel on to the next Show location, some trunks go back to the Main Office for restocking. All of the Show staff works together really well. When one area is packed, we move on to another area that needs help. This continues until everything is packed and on its way to the next Festival site. Once we begin loading the tractor-trailer, you can often hear our setup crew saying "It won't fit!" They often say the same thing as we are loading the truck for each Show. And guess what . . . it always does!